American Ballet Theatre - Romeo and Juliet Event homeCustomer reviews HamiltonThe PromNetworkTo Kill a MockingbirdKiss Me KateHadestownOklahoma! This danced tale of Shakespeare's doomed lovers hasn't gone stale at all - with strong performers, it only deepens with time. Why See American Ballet Theatre - Romeo and Juliet? Misty Copeland to star on June 12th (7.30pm) + June 16th (2pm) only! One of ABT's most well known productions, the story of Verona's tragic star-crossed lovers is given a new lease of life by Sir Kenneth MacMillan in this gorgeous production, with Renaissance Italy providing an elegant and period-perfect background for Prokofiev's fantastic and unforgettable score. Two warring families in Renaissance Italy cannot thwart the love between two of it's youngest and innocent family members, when they meet at a masquerade ball. Romeo of the family Montague, convinces Juliet of the rival family Capulet to elope in secret, where the elderly Friar hopes that their marriage will be the key to everlasting peace between the two factions. Tragically their married life is over before it begins as Romeo is antagonised into killing Tybalt, Juliet's cousin when the latter murders Mercutio, friend to Romeo. Romeo must leave Verona in exile, and leave Juliet behind to marry the eligible Paris. But Juliet concocts a plan with the Friar; she will feign death by poisoning, and wait for Romeo to steal her away once the Friar's word reaches him. Alas, it is not to be as the news of Juliet's death reaches Romeo before the letter. He buys true poison and sneaks into Juliet's resting place, where he drinks the phial - just in time for Juliet to wake up. Bereft at seeing her Romeo dead, she curses the heavens and kills herself using his dagger - a terrible price for two families to pay for their senseless feud. 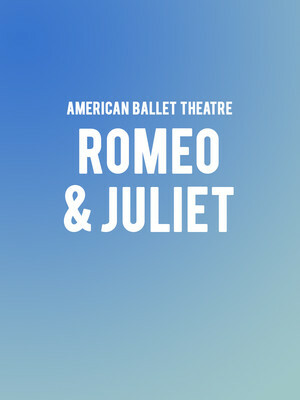 Seen American Ballet Theatre - Romeo and Juliet? Loved it? Hated it? Sound good to you? Share this page on social media and let your friends know about American Ballet Theatre - Romeo and Juliet at Metropolitan Opera House. Please note: The term Metropolitan Opera House and/or American Ballet Theatre - Romeo and Juliet as well as all associated graphics, logos, and/or other trademarks, tradenames or copyrights are the property of the Metropolitan Opera House and/or American Ballet Theatre - Romeo and Juliet and are used herein for factual descriptive purposes only. We are in no way associated with or authorized by the Metropolitan Opera House and/or American Ballet Theatre - Romeo and Juliet and neither that entity nor any of its affiliates have licensed or endorsed us to sell tickets, goods and or services in conjunction with their events.